The oil complex saw mixed results after a somewhat disappointing EIA report. Crude prices fell 35 cents yesterday, as the EIA confirmed a smaller than expected draw this past week. Crude is trading mostly flat this morning, lossing another 9 cents (.07%) this morning, bringing prices to $54.21. Diesel also fell yesterday, giving up over 2 cents during the trading session, tracking crude prices lower. Higher refinery utilization, the percent of total national refining capacity in use, also likely contributed to the decrease. Diesel prices this morning are trading at $1.8469, shedding 1.56 cents (.84%) from yesterday’s close. Gasoline alone escaped the drive lower for another week, supported by the EIA report of a 4MMb draw. Gasoline prices closed 79 points lower than it opened yesterday. This morning gasoline has recouped the majority of its losses, gaining 68 points (.39%) to trade at $1.7478. Yet again, API forecasts and EIA data were not aligned. 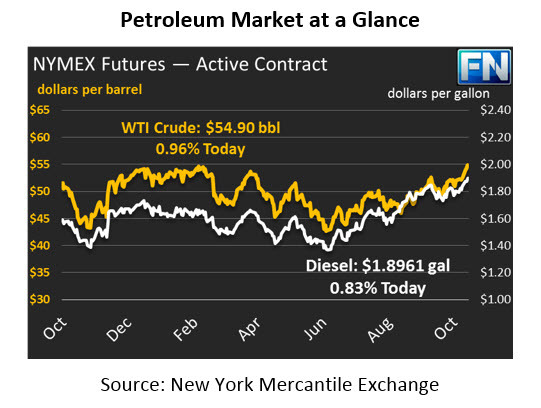 Markets strengthened after the API reported what would have been an 8 year record-high combined crude and product draw of 15.9MMb, but EIA data paled in comparison reporting only a 6.5MMb combined draw. Gasoline alone made up 4.0MMb of the draw, bringing stocks down to only 2MMbbls above the 5-year average. Although the draw was over 3MMb below API forecasts, it was sufficient in calming the market’s fear of gasoline weakness. Crude oil production in the U.S. rose by 46kbpd to 9.55MMbpd. Exports rose by 0.2MMbbls to reach a new all-time high of 2.1 MMbpd, breaking the previous record of 1.98 and pushing past the 2MMbpd level, achieving what many experts said could be accomplished this year. 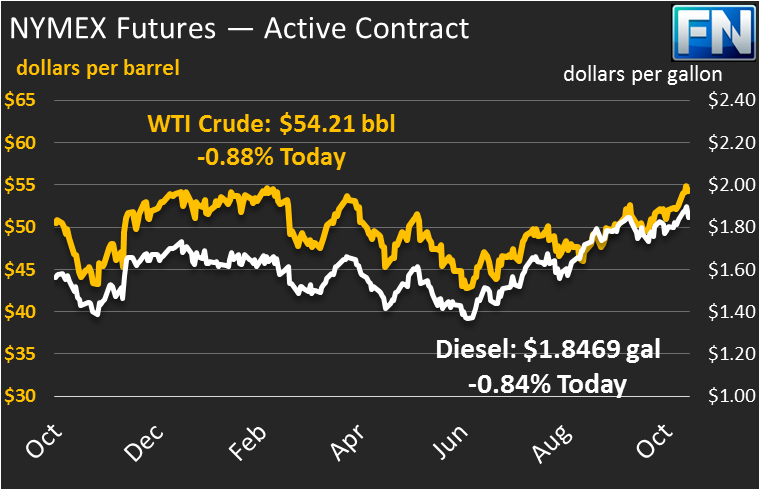 The spread between U.S. WTI crude and international Brent crude remains high, over $6 today, which is encouraging exports as producers capitalize on higher prices in other markets.